With bounce houses, cotton candy machines, velcro walls, dunk tanks and more, Laff-N-Grin provides healthy, active fun for your next party, event, or fundraiser! You just sit back, watch and enjoy! YES! We have INDOOR Bounce Houses! Servicing North New Jersey and Rockland county in New York, Laff & Grin Amusements provides a full line of inflatable fun: Bounce Houses, Inflatable Slides, a Velcro Wall, Obstacle Course and NOW Combo units! We also have a “steel-cage” Dunk Tank and FUN FOODS too! Dunk Tank – Our “steel-cage” dunk tank holds over 400 gallons! Fun Foods – Fun Foods make your party special! Cotton Candy, Popcorn makers and more! 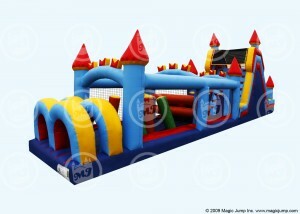 Special Discounts when renting inflatables! With our variety of offerings, we can rent a single inflatable for a birthday party, or set-up as a major kids amusement center of street-fairs and events. We can make a birthday party, school, church or club event a special and memorable one, or we can make your fundraiser more profitable! Don’t get scammed by fly-by-niters! Our safe, clean, bright attractions are fully inspected and licensed by the state of New Jersey and we are fully insured. We deliver, set-up and return to breakdown when the event is over. Attendants can also be provided for public events.